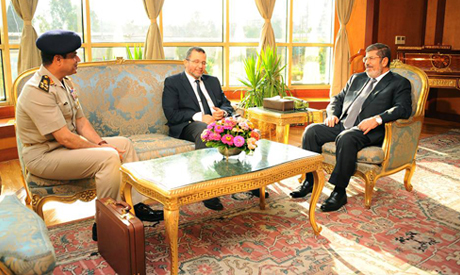 The official Facebook page of the Egyptian presidency published a brief entry on Monday evening stating that President Mohamed Morsi held a meeting with Prime Minister Hisham Qandil and Minister of Defence General Abdel-Fattah El-Sisi, although it was not clear if the meeting had concluded or was still taking place at the time of publication. No details about the discussions at the meeting have been announced. The meeting was unveiled a few hours after the armed forces, headed by El-Sisi, issued a statement giving political forces 48 hours to “fulfill the people's demands,” or the armed forces will put in place a “political roadmap” for the country. Earlier on Monday, the government of Hisham Qandil was rocked by four confirmed ministerial resignations in support of the weekend’s mass protests against President Mohamed Morsi. On Sunday, millions of Egyptians took to the streets nationwide to demand early presidential elections. Sixteen died in clashes around Egypt, including eight in violence at the headquarters of the Muslim Brotherhood in Cairo's Moqattam, which was then ransacked and looted.